If you need a research paper written on the History of Piracy, Paper Masters will custom write one for you. Use the template below for writing a research paper on piracy or have our writers custom write a project on any pirate or aspect of piracy you need. Blackbeard and other pirates have lived within the imaginations of the public for centuries. Even during their lifetimes, much of what known about these people were based on rumors and though this made people fear them, they were also seen as some of the first tabloid celebrities, everyone wanting to know more about them. As time went on, the true depiction of Blackbeard and his men were lose to legends and folklore. Angus Konstam’s book combines written accounts, legends, and archaeological evidence in way that helps to tell the true story of Blackbeard and what it was like to live the life of a pirate at the time. Historically accurate, research papers on the history of piracy from Paper Masters create a political picture of the English colonies at the time but explaining the differences in how each colony was set up, their leadership, and how the king retained his authority over the governors. 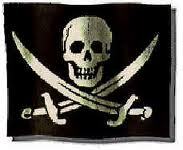 With this political understanding of the world around piracy, it can be seen how a pirate is more than just a criminal but a pawn in a political game of who gets credit, governors from many different colonies competing amongst themselves instead of combining their forces to capture the man. Our writers also depict the political structure of the pirate ships at the time. Instead of a pirate being in charge of his men because they feared him, it was a surprisingly egalitarian organization that was actually appealing to those sailors whom he encountered. Many times, the sailors on the ships that were conquered would become pirates under him. Introduction - In this section you want to arouse reader interest and to show readers why they should read this paper. Identify the subject, including establishing the controversy. Provide background information, including one paragraph of history, one paragraph defining key terms (if appropriate), one paragraph focusing on the general or personal significance of this controversy. End with thesis - the point you are proving in your paper. The thesis needs to be clearly stated at the end of your introduction. Review of the Literature - In this section you want to convince readers that you are familiar with what others are saying about this topic, and you want to lay a foundation for presenting the details of your argument. Name the experts who have addressed this problem, listing them in your opening paragraph to this section, making sure that you include experts who both support and disagree with your thesis. Summarize the views of' each expert, presenting the experts in a logical order that meets the needs of your argument. End the section with an overview of what the experts say (sort of a summary to help your readers). Discussion of the Issues - In this section you make the differing viewpoints talk to one another on each controversial issue you present. You also make a case for the view that you believe is correct. Analyze the topic, issue by issue. Before moving on to the next issue give some sense of what you believe the research reveals to be the appropriate view of this issue. For each issue repeat the procedure outlined for first major issue. End the section with a paragraph to tie pieces together and prepare the audience for the conclusion to your paper. Conclusion - In this section you restate your thesis and summarize for your readers how you proved it. You also suggest some- thing further about the topic or thesis. Go beyond the thesis to comment on the significance of this research, offer a course of action, suggest additional work needed (if appropriate). In this section you give your readers the sources you used. If there are any that they want to look at this section gives them the necessary information so that they can find the sources. Paper Masters writes custom research papers on History of Piracy and examine an order placed on History of Piracy with specific template requirements.